For most musical acts, getting a boxed set is the grand finale to their career. Look at Hall & Oates. The most successful pop duo of all time, Hall & Oates are only getting their first boxed set in October. In contrast stands Richard Thompson, a man dubbed by Rolling Stone as one of the 20 greatest guitarists of all time, alongside the likes of Eric Clapton, Jimmy Page, Robert Johnson and Jimi Hendrix. (Thompson has jammed with most of them, though Johnson has proven a hard nut to crack.) 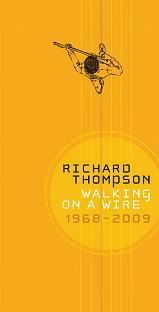 Thompson is onto his third or fourth boxed set (depending on how you count them), this one a career-spanning collection of his greatest hit(s) called Walking On A Wire ($59.98; Shout Factory). Like Neil Young, Thompson has enjoyed extraordinary critical acclaim playing with various groups: first with the legendary (and still-ongoing) Fairport Convention, the UK group that did for British folk music what the Band did for Americana. Then he recorded for ten years with then-wife Linda, producing a string of brilliant albums capped by Shoot Out The Lights, regularly listed among the best albums of all time (Rolling Stone named it one of the 10 Best Albums of the 80s, alongside The Clash's London Calling, R.E.M. 's Murmur and Michael Jackson's Thriller). And for the past 40 years, as a solo artist and in collaboration with others like long-time friend Danny "No Relation" Thompson, he's created a body of work -- solo albums, live albums, film scores (like the brilliant work for Werner Herzog's Grizzly Man), concept albums, a project cheekily highlighting popular music for the past 1000 years and other odds and ends -- that will clearly stand the test of time. All of it is linked by his witty, scalpel-sharp songwriting, distinctive guitar work on both the acoustic and electric guitar (no one is his equal on both instruments) and a gruff, increasingly expressive voice that has flowered as Thompson took center stage after working with two of the greatest pop singers of the past 50 years: Sandy Denny and Linda Thompson. Thompson is amiable as we talk by telephone, revealing the self-deprecatory, dry wit he uses on stage. He offers up the usual jokes about being boxed up a la a coffin, agreeing with my compliment about the vivid cover art and discussing the liner notes by Thompson biographer Patrick Humphries. I assumed he hadn't read Humphries' biography of himself. After all, he had lived it. But I was partially wrong. "I must admit, I did skim it a bit," says Thompson, talking from his home in California, where he lives with his wife and children. Did he skip to the end of the book to find out how it turned out? "No," he laughed. "I didn't want to find out the very end. But I thought he captured the details of life in London very well, You'd go see a black and white movie and then you'd walk out of the cinema and it was still black and white." The 60 year old Thompson is referring to the gritty post-war years dominated by food rationing. "Of course, your inclination when looking at a biography of your life is to think, 'Is that it?'" he says. "A lot of the juicy bits get left out." Presumably, that part of his life can be found in his music. "Well, yes, you hope that's another sort of biography." Indeed, Walking On A Wire is an exemplary overview of Thompson's eclectic career, including at least one track from almost every album he's recorded. The 71 songs across four discs are also remarkably uniform: Thompson arrived almost full-blown as a talent. Though he's matured and grown over the years as any serious artist must, an early song title like "Old Man Inside A Young Man" captures the wise-beyond-his-years tone of Thompson: his rueful take on romance, a sometimes cynical worldview and sheer rapturous joy in living that comes across on "Wall Of Death" and "I Want To See The Bright Lights Tonight" and especially through his ecstatic guitar solos. Thompson has been in one band or another since he was 11, such as the early effort Emil & The Detectives (named after a German children's book that served as the basis for a Billy Wilder film before that director emigrated to America. Indeed, Wilder's wonderfully bitter worldview is a good match for Thompson. They can be bleak, but they're having so much fun being bleak that it makes the sting of their cynicism easier to bear. And both are terribly funny, even if the humor comes in a gasp of recognition at times.) He was performing with Fairport Convention while still in high school. "I would be out gigging with them at night and stumble into class the next day in a daze, trying to focus on English literature," says Thompson. His father was a detective at Scotland Yard but an amateur musician whose record collection opened Thompson up to the likes of Les Paul and Django Reinhardt. So his parents were...conflicted about all of this. "They were half perplexed and half-supportive," says Thompson, who assumed -- like them, probably -- that this rock and roll business would last for six months or a year and then he'd get a proper job. Thompson even apprenticed as a stained-glass window maker before finally going full-time into Fairport. The first track on the boxed set is in fact the first track on the first album of Fairport Convention: "Time Will Show The Wiser," written by Emmitt Rhodes for his then band, The Merry Go Rounds. Who found that song, I wondered? "I think it was a friend of the band," says Thompson. "We had friends with very unique record collections. We'd all go down and scour the bins for the latest releases from America and that song was suggested to us." Rhodes hasn't released an album since the early 70s, but he's reportedly back in the studio this year and working on a new album. "Really?" asks Thompson brightly. "That's amazing." Though he has a deep knowledge and love of popular music, Thompson generally freezes in interviews when asked to name-check current artists he's into. You get even less luck when asking about a particular tune: no, he can't quite remember how he wrote that one, he'll invariably say. The first track on the second disc is "Dimming Of The Day." (I've decided to use the first song on each CD of the set as a starting point, since I've been following his music for so long, I literally don't know where to begin.) It comes from one of his very best, Pour Down Like Silver. The cover reveals Thompson visibly embracing his new-found belief in the Sufi mysticism form of Islam and he remains a committed Muslim to this day. He and then-wife Linda lived in a commune for a bit and in trying to reconcile their music career with their faith decided the music should always celebrate G-d in some way. Was that limiting or freeing, I wondered? "A bit of both, I suppose," says Thompson. "As an artist, you need rules of some sort, some sort of structure." Unlike, say, Cat Stevens aka Yusuf Islam, who for many years didn't record at all or only overtly religious tunes, Thompson was always able to incorporate his new faith more subtly into his lyrics. "Dimming Of The Day" is clearly a hymn to G-d, but it also works beautifully as a love song on a more earthly level. We know about his faith today, but what religion was Thompson raised in? "Presbyterian," says Thompson. "My father was really an atheist. But you couldn't be seen not to go, so we went. My mother was really a Roman Catholic, so she was a reluctant Presbyterian as well," says Thompson. Was it hard on them when he converted and became so serious about his faith? "A bit at first, I imagine. I tried to make light of it when I was around them." No reciting of the Koran after dinner and the like? "No, no, certainly not. But I think my mother eventually accepted that I was a person of faith." The first track on the third disc was a concert favorite for years, the jaunty stinger "Little Blue Number." That's off Across A Crowded Room, the last album to date that Thompson recorded with legendary producer Joe Boyd. "Joe was a great A&R man," says Thompson. "Who else would have recorded Nick Drake? Or The Incredible String Band? Or had the ears for Pink Floyd, for that matter?" I mention that I interviewed one of the people who worked on the Volkswagen TV ad that included Nick Drake's haunting "Pink Moon," the title track from one of his albums. "Really?" says Thompson, who agreed with me that this particular use of music in an ad was really well-done. It's not like they used a familiar track by the Beatles or Bob Dylan and the ad was all about people loving the song and preferring to listen to it rather than entering a noisy party. "Yes, and it really did get the Nick Drake ball rolling again. It only took 35 years," laughs Thompson, who played guitar on some of Drake's songs. Did anyone ever ask to use one of his songs in an advert? "No, not to my knowledge. I think I'm a bit too gloomy for them." The first track on the fourth CD is "Hide It Away," from you?me?us?, an album of Thompson's that sort of slipped by quietly. (Some albums, like Rumour & Sigh and Shoot Out The Lights, are too good to be ignored. Others register only with the faithful, no big surprise for an artist who has written more than 400 songs and released so many albums that in the liner notes the code next to each tune to indicate the album it came from begins at "a" and runs through "z" and then starts back again with "aa" and "bb" and so on. "I quite like that tune," says Thompson about "Hide It Away," who recorded it with Mitchell Froom, perhaps the biggest name in producers that he's chosen to work with. "We had a lot of fun in the studio," says Thompson about working with Froom. "We were really going for a garage sound." I was going to ask Thompson which of his albums deserved another look and didn't get quite the attention he felt it deserved. But he's already mentioned his 1999 masterwork Mock Tudor -- a quiet concept album about Britain -- as perhaps the best album he's done. "Yes, we really accomplished in the studio what we set out to do," he says. "And that doesn't always happen." For some, like Thompson, it happens more often than not -- and increasingly, that includes his children as well. Teddy Thompson, especially, has flourished. He was first seen touring with his dad, doing a solo number or two and often singing a duet on the lovely "Persuasion." Since then, he's recorded four albums, each one better than the last and capped by his current release A Piece Of What You Need. He also wrote or co-wrote many of the tunes and performed with his mother on her two comeback albums as well. I joked that the first time I saw Teddy in concert with Richard, I immediately imagined he'd "pull a Jakob" (as in Jakob Dylan) and record a debut album that would go quadruple platinum and create all sorts of family tension. Instead, Teddy has very politely followed the family path of releasing critically acclaimed records and slowly but surely building up a devoted fan base, just like his old man. "Actually, his last album has sold very well, especially in England. It's almost -- dare I say it -- a hit," says Richard proudly. If you love John Martyn's Solid Air or Nick Drake's Pink Moon, give the superlative Pour Down Like Silver a listen. If you love Bob Dylan's Blood On The Tracks or Marvin Gaye's Here, My Dear, go for Shoot Out The Lights. If you love the rootsy, ancient-but-contemporary sound of The Band or The Byrds on Sweethearts Of The Rodeo, rush out and buy I Want To See The Bright Lights Tonight. If you like Green Day's American Idiot or the Who's Tommy, check out the more low-key but equally ambitious Mock Tudor. If you like John Prine and Joan Baez, Fairport Convention's Leige & Leaf could be for you.